and out of them what we are has come. ...which had no boundaries in time and space, where lurked musical and strange names and mythical and lost peoples, and which was itself only a name musical and strange. Short Bio of the Novelist Ross Lockridge, Jr.
"No myth is more imposing than the Great American Novel; but if it is truly unattainable, I believe that Ross Lockridge, Jr. made closer approach than any other writer has, before or since." -Larry Swindell, syndicated Books Editor of the Fort Worth Star-Telegram, July 26, 1998. "My favorite novel of all time is Raintree County. It's about American journalism, patriotism, and a star-crossed love affair a hundred years ago. Like the Bible, you can pick it up, read any page, and gain something. It's poetry. Forget the movie, if you saw it, the book is something entirely different." -Edna Buchanan, author, You Only Die Twice and Cold Case Squad. Recipient of the Pulitzer Prize in 1986 for general reporting at the Miami Herald. 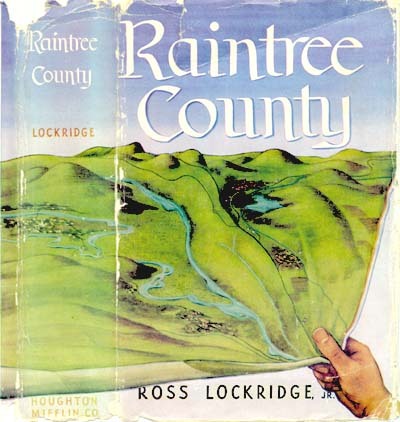 Raintree County is "a work that should rank with Thomas Wolfe's Look Homeward, Angel as a landmark in American fiction." Ross Lockridge, Jr. attempted to "write the great American encyclopedic novel, one that absorbs all the modern literary devices of his day and breathes them forth refashioned on a wind from Walt Whitman." -Donald Newlove, Philadelphia Inquirer.